Well, Punxsutawney Phil saw his shadow this weekend, so you know what that means: six more weeks of winter. But, on the plus side, that means six more weeks to take advantage of all the opportunities for winter recreation in the Stevens Point area! Here are a few of our favorites that you should check out while there’s still snow on the ground. 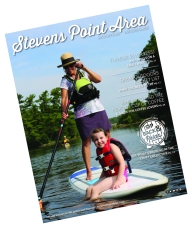 Learn more about winter recreation in the Stevens Point area here. Standing Rocks County Park. Winter-sports enthusiasts will find plenty to see and do at Standing Rocks County Park, a 524-acre facility seven miles east of Stevens Point and Plover. Nearly 10 miles of trails (75% of which are rated as intermediate or expert due to hills and distances) beckon cross-country skiers, while downhill skiers can find five hills and a ski lodge at the park. Green Circle Trail. Explore the 12 trail segments of the Green Circle Trail, a 26-mile trail system that surrounds the city of Stevens Point and cuts through forests, along rivers and through wetlands. 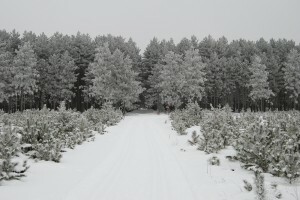 In winter, the Plover River and Iverson Park sections of the trail are groomed for cross-country skiing only, while the remaining sections are fair game for snowshoers, winter hikers and snowbikers. Learn more about the Green Circle Trail here. Ice Age Trail. At the intersection of the eastern edge of Portage County and the western edge of Waupaca County, you’ll find an 18-mile section of the 1,000-mile Ice Age Trail, one of only 11 National Scenic Trails in the country. The trail crisscrosses back and forth between the two counties and is ideal for hiking or snowshoeing. Learn more about Portage County’s Ice Age Trail here. Snowmobiling. Bring your sled to Portage County! Snowmobilers will find more than 300 miles of groomed snowmobile trails in the Stevens Point area, and several Portage County lodging properties provide easy access to trails.